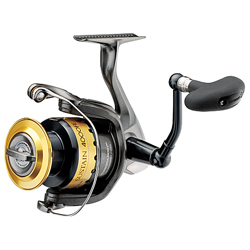 One of the top choices among professional anglers, with a reputation for durability and toughness few other reels can match. However, the addition of the all-new Paladin and Propulsion systems takes this distinction to new heights. The combination of metals in the drive system and advanced line management features will bring a noticeable improvement in your fishing. Smoother and more powerful than ever, with the features top anglers need: lightweight aluminum frame; aluminum spool with titanium lip; Aero Wrap II; machined-aluminum direct drive handle; exclusive S-Concept design; Fluidrive II; Dyna-Balance; Floating Shaft; Super Stopper II; waterproof drag; maintenance port. Includes a FREE spare aluminum spool with titanium lip. "I have the Sustain 2500 on a 7' St. Croix med action rod I use for worm fishing for large mouth bass. I love this set up. The rod is perfect for the reel and the reel is so smooth." "Look, if you've gotten this far in the reviews, you've already seen and read how rediculously awesome it is, stop thinking about it and BUY IT. Got the 6000, I have it on a 8ft, 1 piece and I use it for site casting Cobia/Stripers or in situations where very long casting is necessary." "I bought a 5000 a lil over 3 years ago and only fish in saltwater this reel has yet to do anything i dont like it is perfect." "I bought the 2008 version of the 4000 series and it has to be the smoothest spinning reel I've owned so far. I started with 12 lb. mono and found it was a little too stiff and had a tendancy to backlash."